← Spices 101: What is Turmeric? 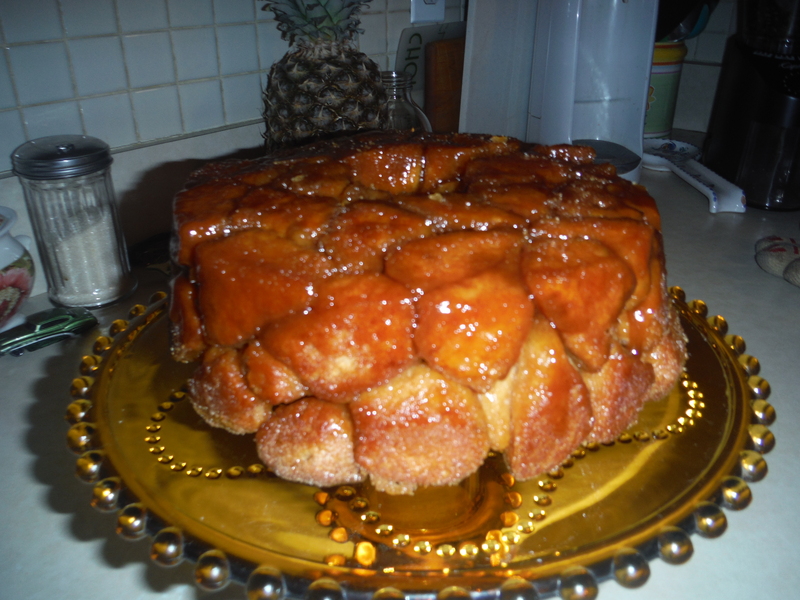 Monkey bread is a wonderful food, with a strange name. No one really seems to know for certain how it got its name, but rest assured – no monkeys are harmed in the making of this delicious treat. And it’s not some weird code disguising something gross, like how “sweetbreads” are actually the thymus and pancreas of cows. Monkey bread is made of biscuit dough cut into small pieces and covered in cinnamon, sugar, and held together with a kind of caramel. 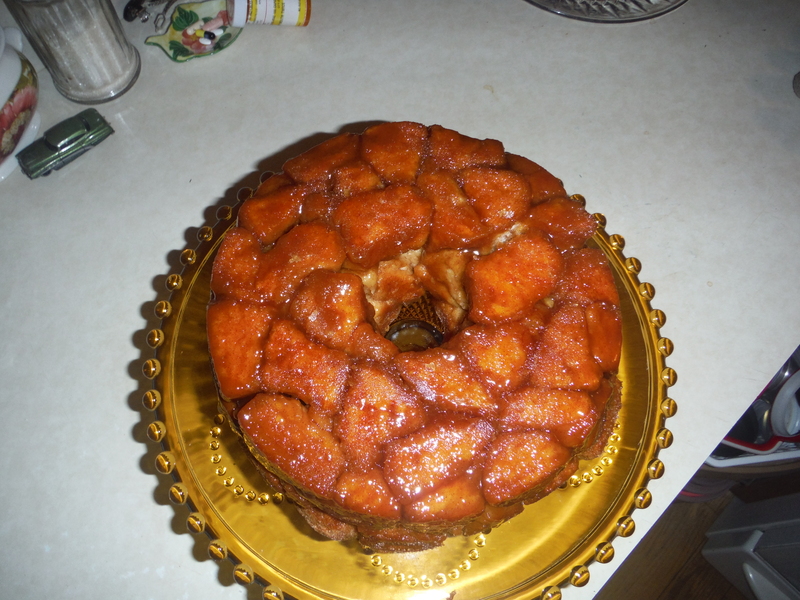 Monkey bread made its first appearance in women’s magazines in the 1950s and fits very much with the vogue of using canned or frozen ingredients and spiffing them up in interesting (and occasionally horrifying) ways. The 1950s ideology was all about making the modern housewife’s life easier with push buttons and quickly prepared foodstuffs. I have fond memories of sitting in my grandma’s kitchen and eating monkey bread that she made, which makes sense since she was a young housewife in the 1950s. I could go on about this stuff forever, since it is part of what I’m studying in school, but I digress. Monkey bread is indeed an easy to make dish that can serve as breakfast, dessert, or just a little snack. If you want to be fancy you can make your own biscuit dough to use, but as we’re all about the quick and easy here, store-bought canned biscuits work perfectly well. Everything you need is easily bought, if not a pantry staple. The only thing you may not have is a tube or bunt pan to bake it in. But you can find them fairly cheap, and it’s a good thing to have on hand if you enjoy baking. Preheat your oven to 350°F. Thoroughly grease the tube or bunt pan. 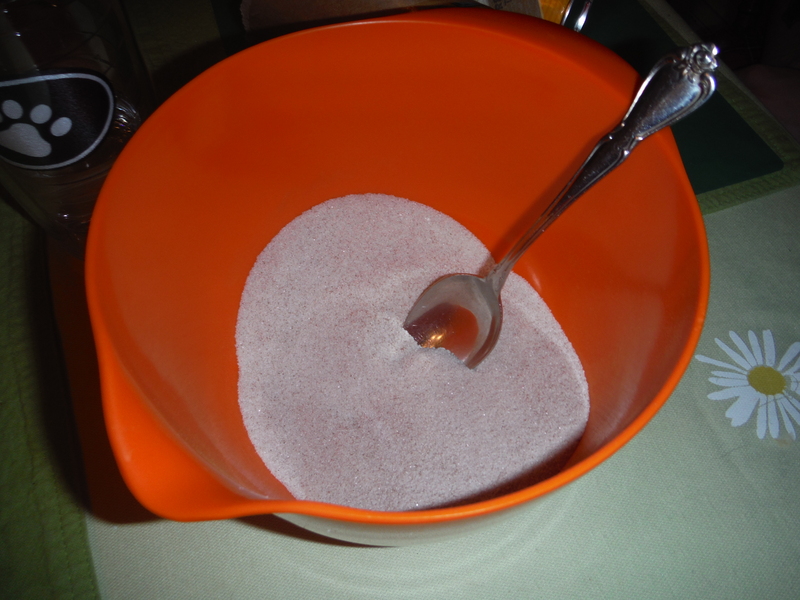 In a small bowl mix together the white sugar and ground cinnamon. 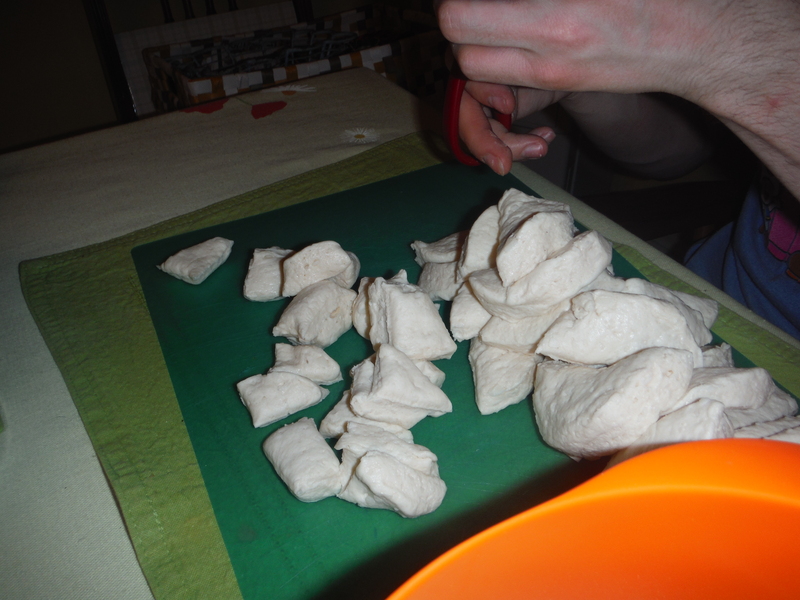 Cut the biscuits into quarters (or about 1 inch pieces) and in small batches toss in the bowl to coat. 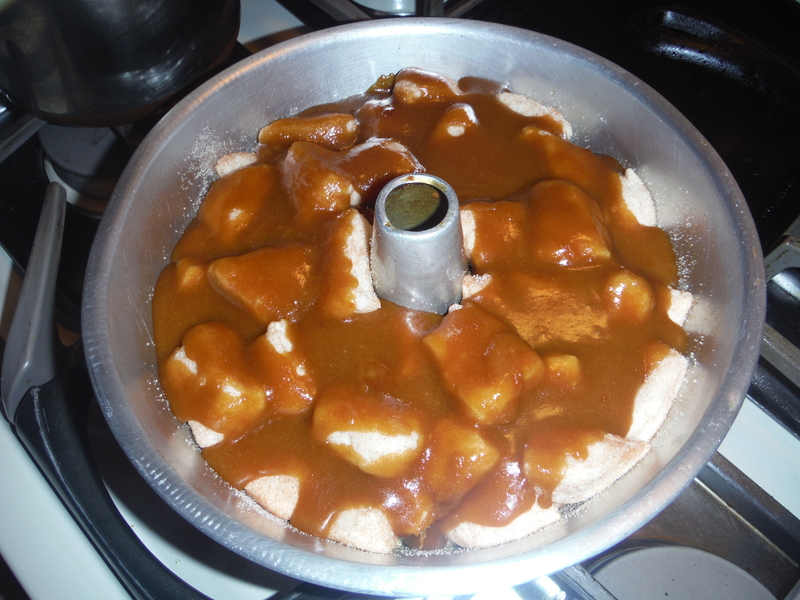 Arrange the pieces evenly in the pan. 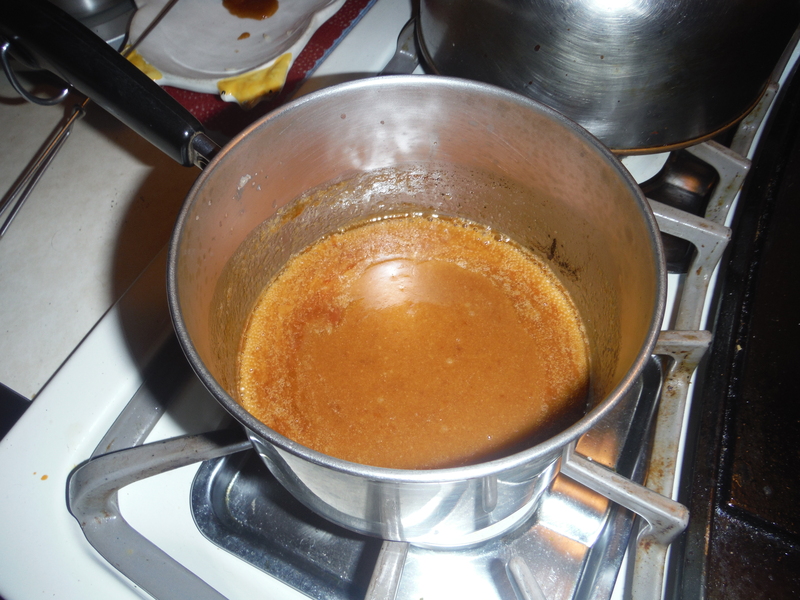 In a small saucepan melt the butter, brown sugar, and salt. Let boil for about a minute, then pour over the biscuit pieces in the pan. Bake in the oven for 35 minutes. Let it cool for at least 10 minutes before removing from the pan. Once set you can eat! The point of monkey bread is to pull the pieces off, but you can cut yourself a slice to pull apart too. 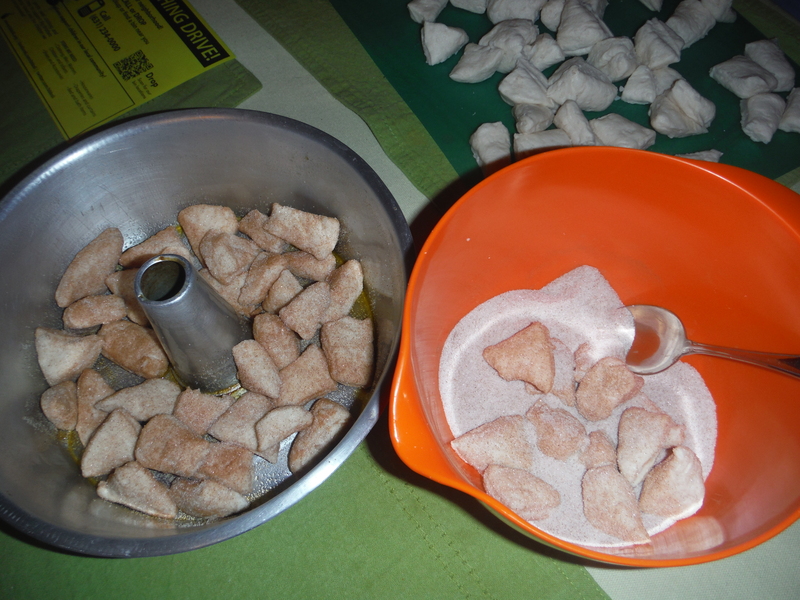 If you have any left over, you can sift out any dough bits and save it with your cinnamon sugar, that I’m sure you keep on hand. The brown sugar and butter all nice and melty. Please be careful, this stuff is super hot and burn-y. 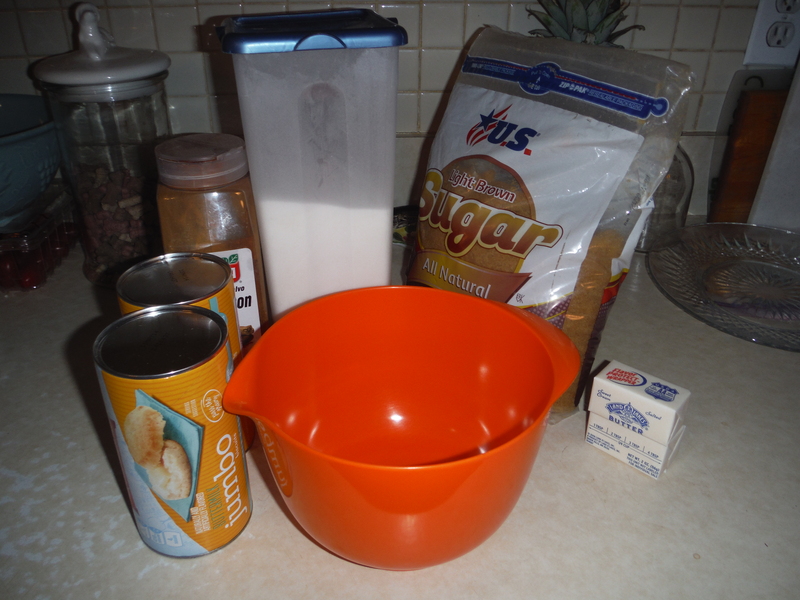 This will make your kitchen smell wonderful and make your taste buds very happy. The hardest part of this is trying not to eat it all in one sitting. Interestingly enough, monkey bread is an almost exclusively American dish, since it was invented here, and not well known outside the country. So you can feel patriotic while eating your monkey bread. Posted on May 9, 2014, in Etcetera and tagged biscuits, blast from the past, breakfast, brunch, cinnamon, dessert, easy, recipes, yummy. Bookmark the permalink. 3 Comments. 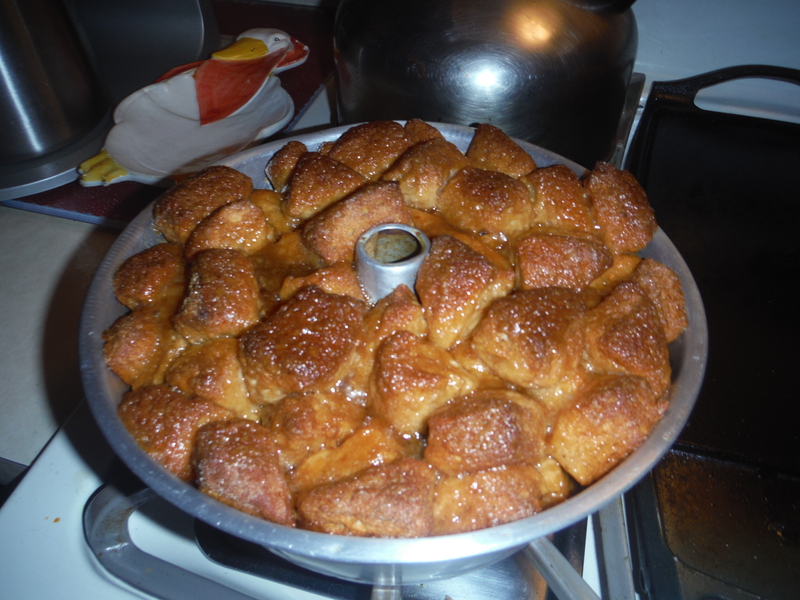 My family always makes monkey bread at family get togethers for breakfast! Good to see we aren’t the only ones! I thought it was a Midwestern thing. Thanks for the history. Yeah, it’s awesome for family breakfasts. :) It’s possible it’s more popular in the Midwest. That side of my family was originally from Iowa.